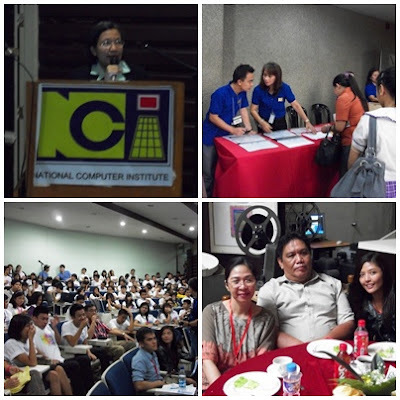 A whole day tech talk with the theme “Empowering the Youth Through ICT” was conducted by the National Computer Institute (NCI) last June 28, 2012 as a part of the celebration in harmony with the ICT (Information and Communication Technology) month. 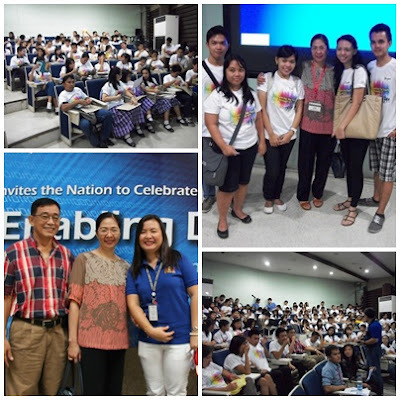 The one day tech talk convened in the NCC Audio Visual Room of ICTO Bldg C.P. Garcia Avenue, Diliman Quezon City was considered special for the event was specifically held for the youth. Despite of the rains, the affair was a total success, it was well attended by students and teachers from 21 schools around the Metro namely, Balara High School, Batasan Hills National High School, Benedictine International School, Centro Escolar University Manila, Diliman Preparatory School, FEU (Far Eastern University) Manila, Justice Cecilia Munoz Palma High School, Krus na Ligas High School, Lagro High School, Lakandula High School, MCU (Manila Central University), North Fairview High School, Paco Catholic School, PCU (Philippine Christian University), PNU (Philippine Normal University), PUP (Polytechnic University of the Philippines), Quirino High School, Rizal Technological University, St. Anthony School of Manila and Sun Valley National High School. The venue was already full of participants even before tech talk started. The atmosphere is full of enthusiasm and excitement, students are eager to listen and learn, and as I observed, most of them are taking down notes. The topics discussed by the speakers are really of their interest, an interlude to feed their hungry minds about technology. “ICT is an important sector of economic activity, achieving high growth rates in developed as well as in developing countries. It is a means to access and exchange data, information, and knowledge, as well as a tool to implement applications such as e-commerce, e-learning, e-health, etc. As such, ICT is an enabler to development. The recent developments in technologies, the reduction in prices of ICT equipment, the greater availability of networks and a more user-friendly approach to technologies are strengthening the role that ICT can play in support of our country’s development. We recognize that ICT holds a lot of potential for the economic growth of our country. So we definitely need to empower the youth with the necessary ICT knowledge and skills so that our country can take full advantage of the potential of ICT.” – Director Juli Ana E.Sudario said during her welcome remarks. 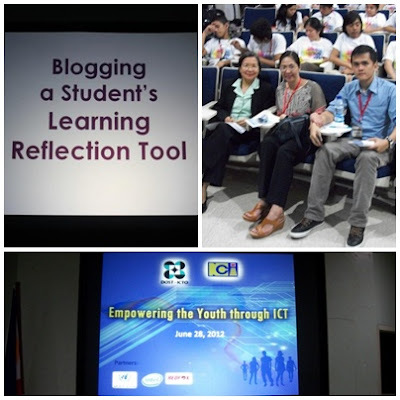 I am very much grateful that I became a part of this important occasion, yours truly has been one of the presenters of the tech talk wherein I discussed about “Blogging as Students’ Learning Reflection Tool”. Eight (8) more speakers shared their knowledge and ideas. To learn more about the forum presentations, please click here to visit the NCC website. 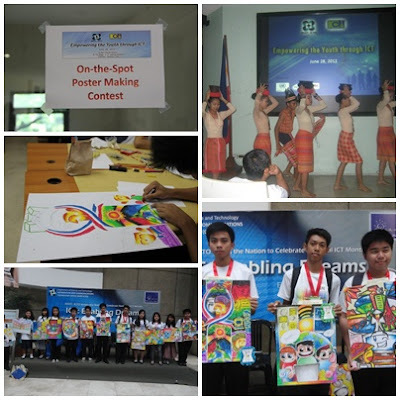 Aside from the forum, on the spot poster-making contest is also one of the highlights of the program joined by some of the participants as well, the Sun Valley National High School Dance Troupe rendered and graced the event with an intermission dance number, lots of raffles are given away too. 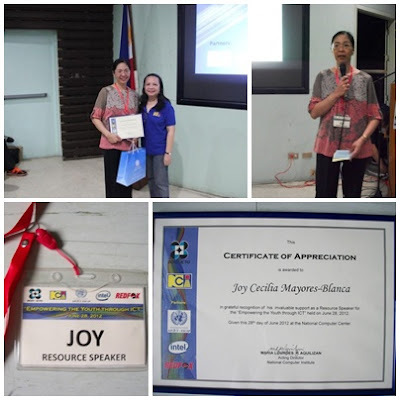 Congratulations to NCI and DOST-ICTO, to its partners United Nations APCICT-ESCAP, INTEL, REDFOX and the Tech talk Speakers who joined hands to make this successful event possible in providing useful information to empower the youth with the necessary ICT knowledge and skills which in the long run can help the younger generations take full advantage of the potential of ICT. This is the stuff na gusto kong salihan at hindi lang yung mga event2x lang.. Dagdag kaalaman kasi to since not all information is served directly to us. How was it Miss Joy? tutyal. kaw na talaga ate joy!! bigatin speaker!!! It is great that there are events like this one. It is a great avenue of opportunity for the youths to learn how to use these ICTs to enhance their talents and capabilities in dealing with their chosen field of careers. Technology has really changed the way we live, do business and communicate. 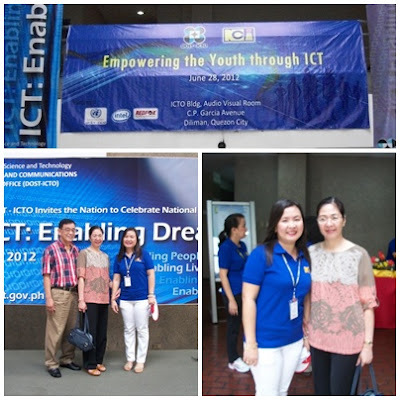 It's great to read that orgs like ICT are preparing the youth of today for the techie world that lies in front of them. Congratulations and job well done! I'm glad that a function such as this was held for the youth of today. Oh, and reading about your participation Ms. Blanca, as a speaker for blogging is even more remarkable, as you have real experience to share to these students. :) awesome!